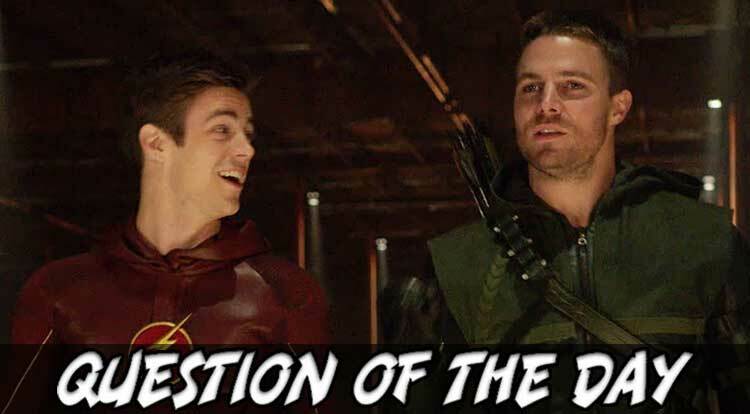 The MS-QOTD (pronounced, as always, “misquoted”) still doesn’t get why he can’t be Green Arrow on TV, asking: What DC character do you most want to see appear in CW’s live-action Arrow-verse? Superman or Batman. I don’t understand why they are so afraid of these characters. They don’t need to be blockbuster budgets if they can get away with Supergirl and Arrow. I have to respectfully disagree, offering a hearty “Please GOD anyone but Big Blue and the Bat!” Their omnipresence, history, and baggage would seriously distract from the charm and inventiveness of the two series. That said, given Arrow’s inclination to feature skills and enhancements over superpowers, Nightwing, Cyborg, Vixen. Zatanna is a personal favorite that they could probably work in. Lots of cool “minor” JLA members I’d love to see on Flash, but that appears to be a Question of Another Day. Since these shows already got some annoying brats (who became better along the line) I’d say put New 25 style super-bratty-Billy Shazam in, he should stir things up quite a bit, especially when everyone realizes how powerful he is. Other than that, basically any b-list JLA member is good: Captain Atom, Zatanna, Vixen and Question would be top on my list. I think a Billy Batson / Shazam would be pretty cool. Drop him in Arrow and you could easily swing between the two shows. Ambush bug of course. Green Lantern would also be great. On the Arrow side of things, since I think Connor Hawke is out of the running, and since we’ve already had an Eddie Fires (done no justice, BTW) I think I’d like to see Master Jansen come in. He could be in flashback as someone who teaches Ollie as he wanders about before returning to the island, and then in the present day story as the Zen master who’s lost his Ashram. On the Flash side of things, I’d totally like a Wally West or Bart Allen type show up. A sidekick that forces Barry to have to deal with the responsibilities of being an mentor/older brother type. 1 – Green Lantern Alan Scott. While my favorite GL characters are all related to the Corps in one way or another, Alan’s powers weren’t originally. It would be more believable to the existing setting that a “magic rock” (Starheart fragment) that was formed into the lantern and ring came to Earth due to the explosion that created The Flash and other Metahumans breaching the walls of reality (perhaps in this setting it is from another dimension/reality and fell through to Earth in that split second breach, which would explain it’s powers seeming to be magical) rather than coming from an organization of intergalactic space cops. The Corps can show up eventually, but it may be asking too much of non-fans if they showed up so early in the development of the shared universe that only recently started showing superpowers on a regular basis. 2 – Ambush Bug. Like GL, I’d tweak his origin slightly and make his powers based on the explosion breaching reality rather than a suit from space, with his portrayal a bit of a cross between how Ambush Bug first appeared (a bumbling villain with a teleportation device in his suit) and how his character is now (an insane semi-hero that often breaks the 4th wall). Start him off trying to rob a bank or store and have Barry stop him, which inspires him to try to be a hero (and annoy the heck out of Barry while occasionally breaking the 4th wall and seeming insane to the rest of the characters, possibly even calling Barry “Grant” or “Mr. Gustin” once or twice and addressing the audience that nobody else sees). 3 – Blue Devil. There have been hints of Blue Devil movies, so why not make the leap to where he becomes a hero? After all, the comic version started off as a stuntman and such before becoming fused to the suit he was using. Just change “stuntman” to “star” and you’ve already got the basics ready to go in the setting. 4 – Blue Beetle and Booster Gold. Okay, so technically two characters, but why have one without the other? Time travel is already in play in the setting, so Booster Gold showing up wouldn’t be too far a stretch of the imagination. Blue Beetle could be either Jaime Reyes or Ted Kord and either could work in the setting. If it were Jaime, however, I would say change his scarab from alien tech to being advanced or futuristic Earth tech (although it could still be partially alien in origin, such as parts made with material from meteorite fragments, it would be more organic to the setting if it weren’t simply an alien device/organism). 5 – Static. Once again, alter his origin to be tied into the explosion that created The Flash and other metahumans. He may not be the most popular superhero character in the DCU, but I think his powers would be plausible within the setting. Plus, it would be fun to see a few younger heroes that aren’t sidekicks and aren’t normally associated with Flash or Green Arrow. Blue and Gold FOR SURE. I’d personally love to see more Justice Society members. I’ve always wondered why no one has thought to include The Sandman (Wesley Dobbs, not Morpheus). His appearance in the Starman series a few years back as an older hero was very interesting. Plus, if Arrow really wanted more of a Detective-type character without using Batman, he’d be a perfect choice. Kyle Rayner. I’d love to see Kyle Rayner show up. He’d be a great match for the younger Grant Gustiny Flash, I think.. and that could really open the door to a space spinoff show for the same shared universe. Give us Kilowog, give us Larfleeze, have some fun with Adam Strange but above all else… give us an excuse to have an excellently done Martian Manhunter on the small screen. The Vic Sage Question. He’d fit so well into Arrow, I’m surprised he hasn’t shown up yet. Oh yeah, this goes to the top of my list. Wouldn’t it be amazing if somebody did a successful, respectful version of Apache Chief? Despite being named dropped as dead, The Flash definitely needs to bring in Ralph & Due Dibny. Have them do their schtick, and be a nice counterpoint to all the CW drama. Blue Beetle & Booster Gold could really work. I think Captain Atom is only a matter of time. Other characters Adam Strange, Animal Man, Nightshade. I have a two-parter pitch for Black Lightning and Jim Harper Guardian growing up together, and then reuniting as superheroes to clean up Suicide Slums. Green Lantern might be a suitable candidate, Blue Beetle would also be interesting. I wouldn’t bring in the top 3, I feel it would detract from the strength of both series since they don’t have the “Gotham syndrome” yet: in a DC series there must be hints of Batman (with young Bruce Wayne in Gotham) or Superman (like in Smallville).